In this section, we’ll try to answer most frequently asked questions and help you get started with your new hosting account. Think of a domain name as your home address and web hosting account as the space in your house where you place your furniture. These are two completely different things and thus transfer/migration of these two is separate. If you transfer your domain name to HostPapa, it doesn’t mean that your website files will be transferred and vice versa. While you can initiate the transfer of your domain name yourself from your Dashboard, in order for us to migrate your website files from your old hosting provider, you’ll need to contact us via a support ticket, so we can handle that for you. To be able to use email accounts on your mobile devices, you will first have to create them. Just log into your cPanel and access the Email Accounts feature under the Email section. Once there, you will need to input the email address you would like to set up with your domain name, as well as choose a password. For example, you could create a [email protected] email address and a password you can remember. Below is the information you will need to use when setting up your email accounts on personal computers or mobile devices. 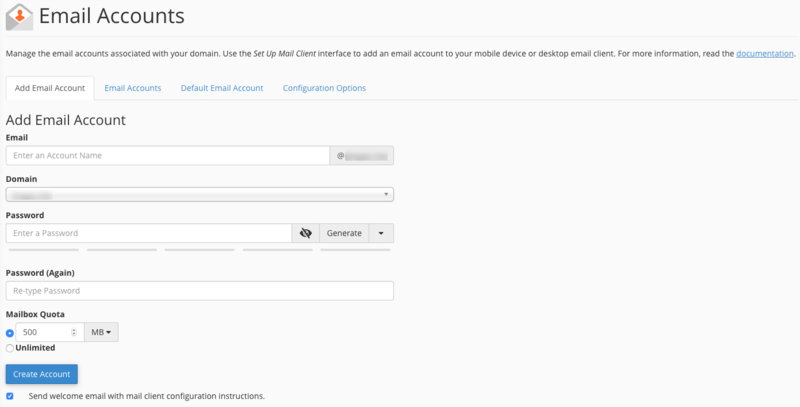 Our SMTP Outgoing email server requires server authentication for your outgoing email, and you can read more about it here. You can access your email anytime through HostPapa Webmail services as well as via http://www.yourdomain.com/webmail URL. Everything is set up and configured, but you can’t check the look of your website due to DNS propagation? You can work around it! In this article, you can find a workaround for this problem. You’ve uploaded your website, and your domain is live, but you’re not able to find it on the web? Don’t fret! Please check this detailed guide on how to fix this issue. You’ve already completed working on your primary website, and now you’re ready to add a new one? HostPapa provides you the ability to host multiple domains on your account, and you can learn more about this here.